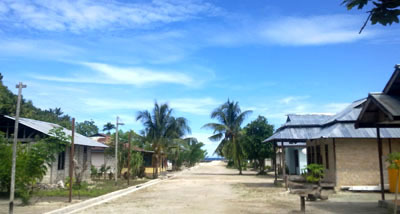 A pristine village resides in Mansuar Island and the name is Yenbuba. It even becomes a recommended vacation spot for those visiting Raja Ampat. The serene nuance and warm villagers would give positive impressions to tourists. The beauty is untouched and the environment is neat! What can beat those qualities? Not to mention the location is near to the coast, coming with breezy wind and stunning beach views. Apart from nature, the village is famous for its local’s routine and the presence of the church. Simply put, it is a worthy place to visit. The most noticeable part of Yenbuba Village is the pier. It is long and comes in a good condition. In this location, both tourists and villagers often spend time for fishing. Also, it becomes the first spot to go snorkeling, especially for beginners. From the pier, tourists can see some boats and pristine sea scenery as well. When it comes to the village, some traditional structures reside. The atmosphere is serene as it is located in a remote area. In the back, there is a mountain, on which visitors can explore. Some dogs are seen, too! The majority of the villagers are Christians, despite the fact that Indonesia is dominated by Muslim. Regardless of the difference in faith, people live harmoniously in Yenbuba. On top of that, people who live in Yenbuba are open to visitors. They might help tourists regarding some necessities like foods and shelter. It is even possible to stay in their house at night. In the afternoon, some kids play around and they look quite happy. This atmosphere would comfort any tourists, for sure. What’s next? Apart from unspoiled nuance, Yenbuba Village is famous for its snorkeling spot. The fact is Mensuar Island becomes one of the best locations to go diving, so Yenbuba is included. The nearest spot is below the pier, but more beautiful attractions are available out there. For professional divers, it is possible to reach more varieties of marine life. Thanks to clarity or visibility of the water. For beginners, it is better to start from the easiest spot. The reason is the current is a little bit rough in the midst of the sea. The next activity is to get closer to the villagers. It becomes an opportunity to learn their culture and language. Some of them may offer tourists some foods and drinks, as well. Their foods are great! Also, don’t forget to take pictures with them. It is an unforgettable experience, so everyone should take advantage of the trip to Yenbuba someday. That means tourists should pay a visit to the village when spending time in Mansuar Island. Yenbuba Village belongs to Mansuar Island. From Jakarta, it takes a flight to Marinda Airport, which is located in Waisai City. Next, they can take a speedboat from Waisai Port to Mansuar Island. The trip takes a little bit time, but it is worth an effort.